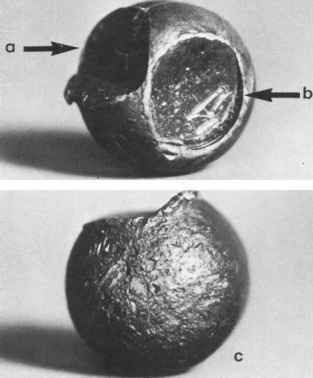 Figure 2.9 0.44-caliber ball showing (a) shearing of one surface, and (b) marking from loading rammer. Opposite surface has a peppered appearance due to black powder (c). anywhere from several thousand to 50-60 thousand pounds per square inch.10 The pressure of the gases on the base of the bullet propels it down the barrel. 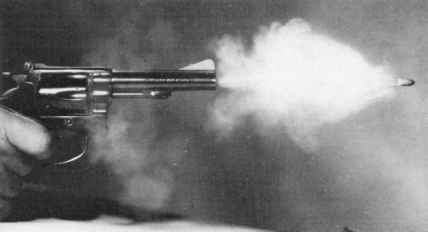 As the bullet travels down the barrel, some of the gas leaks past the bullet, emerging from the muzzle ahead of it. The bulk of the gas and any unburnt powder, however, emerge after the bullet (Figure 2.10). 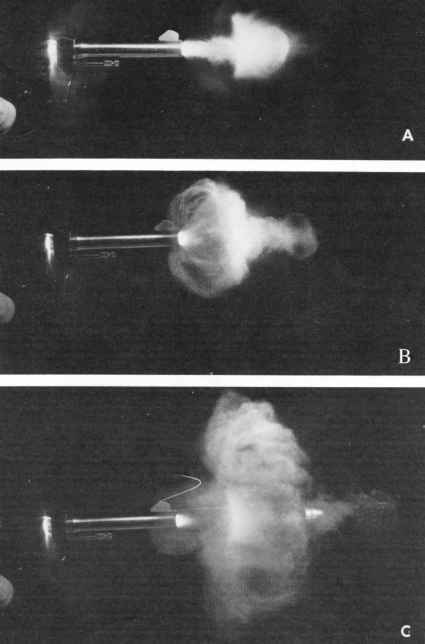 Figure 2.10 A-C. Small gas cloud emerges from barrel followed by bullet and larger cloud of gas (.38 Special Colt revolver). combustion. The size and shape affect the burning rate by controlling the amount of surface area exposed to the flame. The greater the surface area, the faster the combustion. The object of controlling the burning rate of powder is to achieve "progressive burning." Ideally, the propellant should start burning slowly, gradually increasing its rate of combustion until it is completely consumed just as the bullet leaves the muzzle. Such ideal burning powder is virtually never achieved because the same powder is used to propel bullets of various calibers and weights down barrels of different lengths. The author has knowledge of one case, where on test-firing a rifle, some amorphous black material exited, but no intact grains of powder.11 The firearm involved was a .30-06 caliber rifle with a 22-in barrel firing a 220-gr. softpoint bullet propelled by cylindrical powder. Bullet weight causes variations in burning by altering the pressure of the gases in the firing chamber. When powder is ignited and gas forms, the bullet does not begin to move immediately. There is a small interval of time necessary for the gas to overcome the inertia of the bullet and the resistance of its passing down the barrel. This interval increases with the weight of the bullet if everything else remains constant. As the interval increases, the pressure increases, causing the powder to burn faster and give off more heat. The heat in turn raises the gas pressure. If there is an ideally progressive burning powder for a specified bullet weight and that weight is increased, the interval will increase and the powder will burn faster. Therefore, the powder will be burned before the bullet leaves the barrel. Lightening the weight of the bullet would cause the opposite effect; in this case, not all the powder will be burned before the bullet emerges from the muzzle. Varying the length of the barrel also affects how much powder exits the muzzle. Shortening the barrel causes more unburned powder to emerge. Lengthening the bullet results in the consumption of more powder before the bullet emerges. When a bullet exits the barrel, it is accompanied by a "flame" consisting of incandescent superheated gases and a "ball of fire" — the muzzle flash. The flame is usually no more than 1 to 2 in. in length in handguns. The flame is of little significance except in contact and near-contact wounds, where it may sear the skin around the entrance wound. It cannot ignite clothing. Accounts of close-range firing igniting clothing date back to the use of black powder in cartridge cases. The "ball of fire" emerging from the muzzle consists of oxygen-deprived gases produced by ignition of gunpowder. When they emerge from the barrel at extremely high temperatures, they react with the oxygen in the atmosphere, producing what is commonly known as the "muzzle flash." This should not be confused with the flame. Figure 2.11 A cloud of gas can be seen emerging from the cylinder-barrel gap. In revolvers, in addition to the gas, soot, vaporized metals, and powder particles emerging from the muzzle of the weapon, similar material emerges from the cylinder-barrel gap (Figure 2.11). If the cylinder of the weapon is not in perfect alignment with the barrel, fragments of lead will be avulsed from the bullet as it enters the barrel and will also emerge from this gap. In revolvers made to close tolerances, the amount of material escaping out the cylinder gap is relatively small and fragments of lead will be absent. In less well-made or worn guns, however, considerable debris may emerge. In either case, the soot and powder emerging from the gap may cause powder blackening and powder tattooing of the skin, if the weapon is held in close proximity to the body. 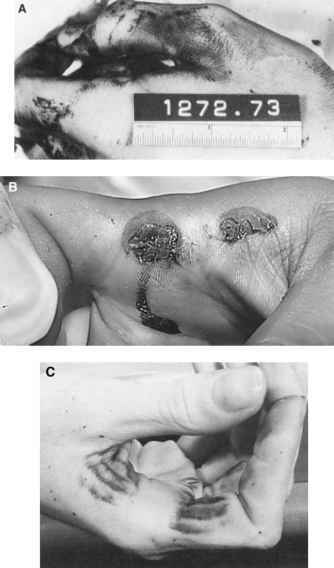 The fragments of lead shaven from the bullet as a result of the misaligned cylinder may impact the skin causing stippling and even become embedded in the skin. Haag defines a hangfire or delayed discharge "as one that is of abnormal duration and perceptible to the shooter by means of sight or sound".12 The hammer falls; there is a click and after a delay, the gun discharges. The typical time interval from the firing pin striking a primer to the bullet exiting the barrel is 4 msec. The minimum time interval that a person can perceive a delay in firing is approximately 30 to 60 msec. Theoretically, hangfires can be caused by contamination and/or degradation of either primers or propel-lants. In a series of experiments attempting to induce hangfires, Haag was unable to do so by contamination or degradation of primers. The primers either discharged or misfired (failed to fire). No hangfires occurred. Contamination of propellant with oil or alcohol/water solutions resulted in both misfires (failure to fire) and hangfires. The duration of the hangfires was estimated at 200-250 msec. In addition to the delay, Haag noted other characteristics of hangfires: reduced velocity; reduced report; substantial quantities of unburnt powder in the cartridge case and/or bore of the gun; sooty deposits on the exterior wall of the cartridge case and little or no expansion of the case. Haag concluded that with modern ammunition hangfires are rare.